Bobby Davis reports: " The concept of Stealth was written quite well into the flight simulator. There were specific options that could be taken. The Stealth Fighter actually used a stealth weapons load to complete missions. These weapons allowed the attacker to strike with limited response from the defender. This is similar in concept to the Advanced Air Launched Cruse Missile." Stealth Mission was released in 1989 for the Commodore 64 and 128. 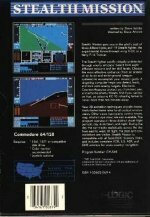 It used the graphics engine developed by SubLogic for Flight Simulator II.